Visits to U.S. national parks set a record in 2016. The record was set for the third year in a row. Landmarks such Zion, Yellowstone and Rocky Mountain saw historic levels of popularity. But these also brought headaches. They stem from overcrowded roads and trails. Not to mention increasing visitor misbehavior. At many parks, visitors waited an hour or more in cars. That was just to get through entrance gates. Then they spent the day trying to outdo fellow visitors. The visitors looked for parking spots and room to walk on popular trails. They left behind huge amounts of trash and sometimes, human waste. Encountering a crowded, Disneyland-like situation when people were expecting peaceful serenity can lead to aggression and bad decisions. That is according to park officials. "The level of frustration, we've certainly seen an increase in that," said Kyle Patterson. She is Rocky Mountain National park spokeswoman. "Sometimes they take it out on each other. And sometimes they take it out on a park. It created a good news-bad news story for park managers. They praise the increased interest. But they are struggling to preserve iconic mountains, slot canyons and wildlife habitat for future generations. The National Park Service budget has remained basically the same. That leaves parks to deal with the problems without higher staffing levels. "We love having people come to the park," said John Marciano. He is the Zion National Park spokesman. "But our No. 1 goal, our mandate, is to preserve the park into perpetuity. And to ensure our visitors have a best of kind and safe experience." Overall visitation to national parks is on track to surpass 325 million in 2016. That would break the all-time high of 307 million. It was set in 2015. This is according to federal figures. The record-breaking three-year stretch came after parks visitation rose and fell between 255-287 million. This occurred for nearly three decades. The National Park Service launched a major marketing campaign to celebrate its 100th birthday. That was in 2016. The campaign included free passes for every fourth-grader and their families. 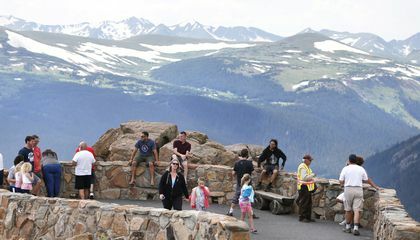 That renewed attention coupled with reasonable gas prices and an improved economy likely fueled the increase, said National Parks Service spokesman Jeffrey Olson. The agency's "Find Your park " campaign will continue this year. Officials expect to surpass 300 million visitors again even if there's no record, Olson said. Absent from December totals, the Grand Canyon in northern Arizona hit 5.9 million visits. Yellowstone stretches into Wyoming, Montana and Idaho. The park had 4.3 million visits. The final year tally for Rocky Mountain in Colorado was 4.5 million. 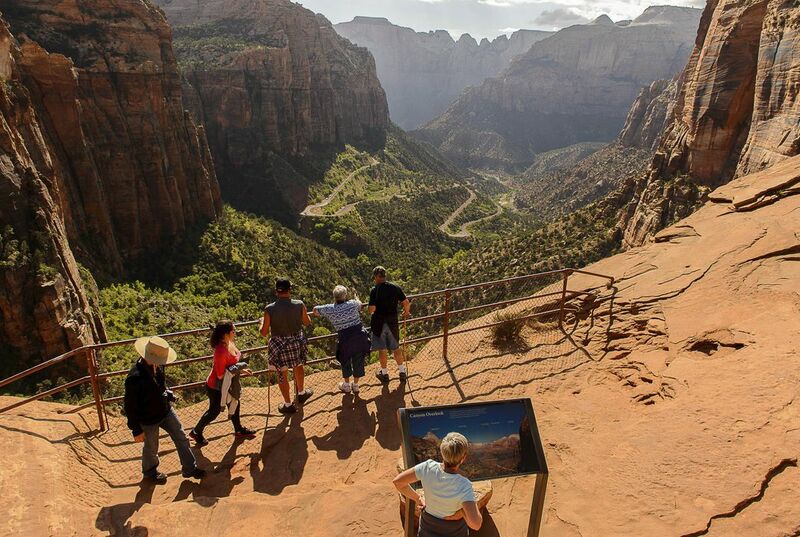 Zion in southern Utah had 4.3 million visitors. It was nearly double the 2010 total. Cramming all those people into the narrow confines of Zion can be a problem. Most visitors want to see the same iconic slot canyons and trails. Many days that has led to hour-long waits to get in the park. Parking lots can fill up by 9 a.m. Shuttle services are also crowded. "Then, you hike like ducks in a row up the trail because there are so many going up the same trail," Marciano said. "That's not what we want." One employee spent her entire summer hiking every day to the popular Angels Landing trail. She went to clean and put more toilet paper in two portable toilets. They are designed for 40 visits daily. But they had 200, she said. Both Zion and Yellowstone are reviewing how to create better crowd plans. Zion is considering a reservation system for park entries. It also might include a daily visitor limit. Even though it isn't allowed, more people are taking dogs on trails in the Rocky Mountain park. Visitors are also parking cars on native vegetation or fragile alpine tundra. Some are leaving human waste right near backcountry trails, Patterson said. On certain days last summer, the park limited the number of cars allowed on two popular roads, she said. Yellowstone hit 4 million visitors for the first time in 2015 After that park spokeswoman Morgan Warthin said the park offered the "Yellowstone Pledge." The pledge urged visitors to follow guidelines. These included not stopping on the side of the road to look at bears. And, it told visitors not to stray from boardwalks. Yellowstone has also asked visitors to take "safe selfies." That includes staying far away from wild animals. "They want that perfect picture. So they're driven to get closer and closer." That poses a risk to visitors' safety, Warthin said. How would you handle -59 degrees? What are the downsides to this record? There are downsides to setting the record in a national park. Some of the downsides are littering, animals are being killed because some people go to the parks and being guns and kill the animals. Some people enjoy going to the national parks and enjoy seeing the animals, and all of the places/things to see. People who go there to enjoy the park but also liter is making other people's visits bad and un-enjoyable. I hope people stop acting the way they do for all of the parks sake. I think it would cool to go to these parks and learn new things. I think it would better than sitting in a classroom and not going outside and getting fresh air. I think it would be cool to promote it. Its good to see that people have a interest in national parks but humans aren't as bright as they think so that's causing a need for parks to implement restrictions. Some restrictions are ruining things for others with others will just make some people wonder who caused it to be put in place. Overall I think humanity is improving while getting dumb by lessening natural selections effect on humanity. It's great how these parks are getting more and more popularity with the day shoeing that people are taking action to go outside and enjoy the thing the world has to offer. The only bad part about this sudden boost in popularity and people is the amount of disrespect people are having on these monuments of nature. The only thing that needs to change is the rules being put down on people needing to be more strict. I think it's good that all these people go to all these national parks and it's a good thing that they are trying to get more people to come. The national parks are a cool thing to go and see. But it could make you wait for hours the get parking and then go hike. But they are very beautiful and very fun thing to do. I think going to a National Park would be really fun. Especially because I've never been to a large on before. I think it is great for today's young people are becoming more interested in the National Parks. The National Parks would be an interesting place to go as a educational experience. Yes everybody should get the chance to visit national and state parks because it is a amazing experience. More people would go to state parks if they didn't have to wait so long in their cars to even get into the entrance of the park. But the thing is that park managers want more people to come to their park but they also don't want them to come. They want more people because it is such a amazing place to go and a good experience to have and because there is really amazing sites to see. They don't want more people to come because the more people that come then the result is more pollution and garbage in the park. There is more garbage in the park because people get so frustrated that they either take their frustration out on the park or they take it out on the people around them. There are some pretty cool things about more people enjoying and going to national parks. However some people abuse the parks and that isn't ok. The parks are beautiful wonders of nature that shouldn't be treated like garbage.